What an amazing collection of 30 companies showcased their products at the Savor California Booth #604. In the 10 years we've had a SFFS booth, Savor California has an unbroken record of multiple Sofi Award winners in our booth. This year, Pernicious Pickling won both a Gold and a Silver Sofi, and there were other Savor California winners from previous years. 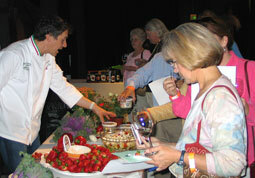 Kelley D'Angelo with her Lark Ellen Farm Grain-Free Bites -- a big hit with attendees.